Euro leaders in Brussels are refusing to discuss an easing of Athens’ debt pile until Greece makes solid reform pledges. That may make sense politically. But debt relief is a necessity, rather than a nice-to-have. If it were offered now, Greeks might budge on structural reform. 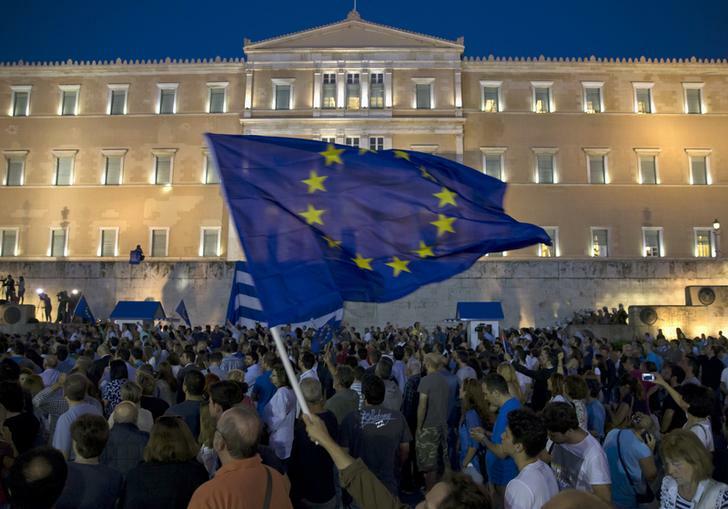 A protester waves a European Union flag in front of the parliament building during a rally calling on the government to clinch a deal with its international creditors and secure Greece's future in the Eurozone, in Athens, Greece, June 22, 2015. Greece’s ruling Syriza party dismissed reform demands from the country’s international creditors as “blackmail” as crisis talks to avert a debt default and a euro zone exit entered a critical phase, Reuters reported on June 25. A parliamentary spokesman for Greek Prime Minister Alexis Tsipras’ left-wing Syriza party struck a defiant tone a day after euro zone finance ministers accused Athens of refusing to compromise despite a looming deadline to clinch a deal. “The lenders’ demand to bring annihilating measures back to the table shows that the blackmail against Greece is reaching a climax,” Nikos Filis told Mega TV. “There cannot be a deal without a substantial reference and specific steps on the issue of debt,” Labour Minister Panos Skourletis said in an interview with state broadcaster ERT. German Angela Merkel is facing domestic opposition to an extension of Greece’s bailout, Reuters reported on June 23. As many as 100 members of Merkel’s conservative lawmakers may oppose the deal, up from 29 that objected to the extension in February, Reuters reported, citing political consultancy Teneo Intelligence. Greece needs an extension to its bailout in order to avoid defaulting on 1.5 billion euros of debt owed to the International Monetary Fund on June 30, and 7.2 billion to the European Central Bank in July and August. The country submitted proposals to creditors on June 22, including proposals to cut pensions, raise taxes and meet primary surplus targets.